For the Appellant :- S. Chandra Shekhar, Advocate. For the Respondents :- V. Shekhar, Senior Advocate with Manish Kumar, Gopal Singh, Anukul Raj, Kameshwar Singh, Zangpo Sherpa, Abhigya, M.A. Chinnasamy and Radha Kant Tripathy, Advocates. A. Indian Penal Code, Section 307 - Attempt to murder - Accused hurled a bomb towards victim - The bomb did not explode - Another bomb hurled, which exploded but victim did not sustain any injury - Held accused guilty of offence under Section 307 IPC even if no injury was caused - Circumstances indicated that accused had intention to murder - Receipt of injury on part of income is not a pre-requisite for convicting the accused under Section 307 IPC. B. Indian Penal Code, Section 307 - Attempt to murder - Intention of accused to commit murder - Intention which is a state of mind cannot be proved by precise direct evidence, as a fact it can only be detected or inferred from other factors - Some of the relevant considerations may be the nature of the weapon used, the place where injuries and the circumstances in which the incident took place. (2004)13 SCC 189 relied. 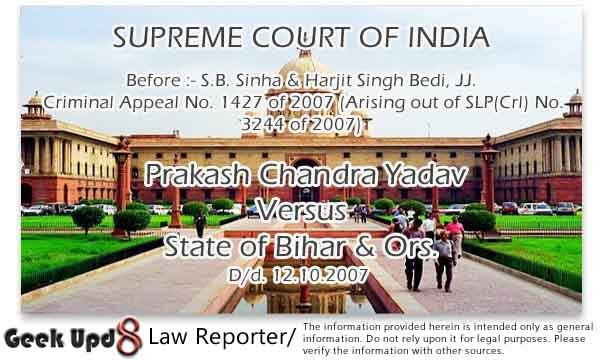 Parsuram Pandey v. State of Bihar [(2004)13 SCC 189]. 2. This appeal is directed against a judgment and order dated 22.12.2006 passed by a Division Bench of the Patna High Court allowing the appeals preferred by the respondents herein and dismissing the criminal revision filed by the appellants herein. 3. The factual matrix of the matter, as stated in the First Information Report, is that at about 12.30 pm on 3.2.1994, the informant, Prakash Chandra Yadav (PW-10) went to Railway Authority Club, Jamalpur to receive the Chief Railway Engineer, Eastern Railway Gorakhpur and Additional Divisional Engineer, Sonepur. He waited for the said officers but having come to learn that they would come later, left the club for his home at about 3.15 pm by his motorcycle. Mantu Kumar (PW-7) was with him on the said motorcycle. 4. Accused, Shyamdeo, named in the First Information Report as also one unknown man, were standing on the road and were allegedly noticed by the informant after coming out of the southern gate of the club. When they were proceeding towards the west, Shyamdeo ordered to kill the informant whereupon Janardan Yadav took out a bomb from his bag and hurled the same towards them. It, however, did not explode. Respondent Satya Narayan Yadav also hurled a bomb towards the informant. It exploded but the informant did not sustain any injury. Several persons assembled at the said place whereupon, Shyamdeo Yadav allegedly chased them with his licensed gun. 5. The said incident is said to have been witnessed by Suresh Yadav, Jawahar Yadav, Ram Naresh Prasad and several others. Besides Prakash Chandra Yadav (PW-10) and the informant, the prosecution examined Suresh Yadav (PW-3), who is the brother of the informant, Jawahar yadav (PW-4) cousin of the informant, Chunkeshwar (PW-2), Ram Naresh Yadav (PW-5), father of the informant and Mantu Kumar (PW-7) (who was the pillion rider) besides B.K. Mishra (PW-9), the Assistant Director, Regional Forensic Science Laboratory, Muzaffarpur, the Chemical Examiner who had examined the alleged explosive substances recovered from the place of occurrence. 6. Accused were charged for alleged commission of offence under Sections 334 and 307/109 of the Indian Penal Code and Sections 3 and 4 of the Explosive Substances Act. Motive for commission of the said offence is said to be rivalry inter se between the parties in regard to grant of railway contract(s). 7. The learned Sessions Judge found the respondents guilty for commission of an offence under Section 307/109B of the Indian Penal Code but acquitted them from the charges under Sections 3 and 4 of the Explosive Substance Act on the ground that no sanction from the appropriate authority had been obtained therefor. Janardan Yadav and Satya Naryan was convicted under Section 307 of the Indian Penal Code and was sentenced to undergo rigorous imprisonment for five years and Shyamdeo Yadav was convicted under Section 307/109 of the Indian Penal Code and sentenced to undergo rigorous imprisonment for three years. 8. An appeal was preferred by the respondent before the High Court. The first informant also filed a criminal revision application against the judgment and order acquitted the respondents under Sections 3 and 4 of the Explosive Substances Act as also for enhancement of sentence. Both, the criminal appeal as also the revision application, were taken up for hearing together by a Division Bench of the Patna High Court. 9. The High Court in its judgment started with the deposition of the prosecution witnesses. As regards the deposition of Prakash Chandra Yadav (PW-10) (informant), it was noticed that he had fully supported the case of the prosecution. Similar narration of the statements made by the prosecution witnesses were carried out the High Court from paragraphs 8 to 13 of the judgment. Paragraphs 14 to 16 referred to the submissions made by the learned advocate for the respondents. Paragraphs 17 to 19 were devoted to the submissions made by the counsel for the appellant in support of the criminal revision application. Paragraph 20 thereof recorded that the sanction accorded by the District Magistrate did not sub-serve the requirements of law. The judgment of the High Court is contained only in paragraph 21 thereof. 10. To say the least, the judgment of the High Court is wholly unsatisfactory. The High Court nowhere arrived at the finding that the prosecution witnesses contradicted themselves in material particulars so as to render their testimonies untrustworthy. It did not arrive at a finding that the findings of the Trial Judge were either unsatisfactory or contrary to the legal principles. The High Court opined that as no injury had been caused to the informant and PW-7, a case under Section 307 of the IPC is not made out. The said finding, in our opinion, is not legally sound. "Section 307. Attempt to murder. - Whoever does any act with such intention or knowledge, and under such circumstances that, if he by that act caused death, he would be guilty or murder, shall be punished with imprisonment of either description for a term which may extend to ten years, and shall also be liable to fine; and if hurt is caused to any person by such act, the offender shall be liable either to imprisonment for life, or to such punishment as is hereinbefore mentioned." "(c) A, intending to murder Z, buys a gun and loads it. A has not yet committed the offence. A fires the gun at Z. He has committed the offence defined in this section, and if by such firing he wounds Z, he is liable to the punishment provided by the latter part of the first paragraph of this section." (b) the doing of an act towards it. For the purpose of Section 307 what is material is the intention or the knowledge and not the consequence of the actual act done for the purpose of carrying out the intention. The section clearly contemplates an act which is done with intention of causing death but which fails to bring about the intended consequence on account of intervening circumstances. The intention or knowledge of the accused must be such as is necessary to constitute murder. In the absence of intention or knowledge which is the necessary ingredient of Section 307, there can be no offence "of attempt to murder". Intent which is a state of mind cannot be proved by precise direct evidence, as a fact it can only be detected or inferred from other factors. Some of the relevant considerations may be the nature of the weapon used, the place where injuries were inflicted, the nature of the injuries and the circumstances in which the incident took place." 14. The said decision, therefore, itself is an authority for the proposition that intention of or knowledge relating to the commission of murder and the doing of an act towards it are the two ingredients of the offence under Section 307 of the Indian Penal Code. 15. The High Court's judgment, therefore, cannot be sustained. It is set aside accordingly. The matter is remitted to the High Court for consideration of the matter afresh. We, however, make it clear that we have not gone into the merit of the matter. The High Court is requested to hear and dispose of the criminal appeal expeditiously. The appeal is allowed with the aforementioned directions.